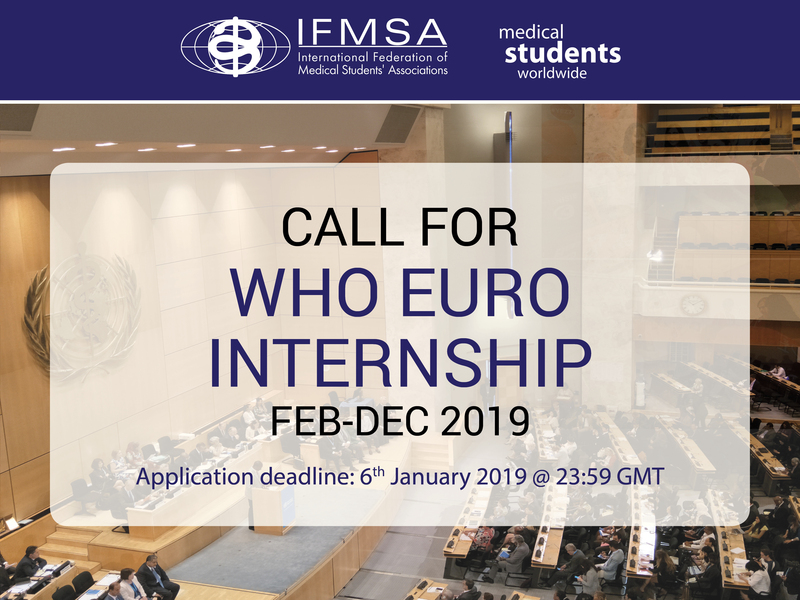 We are pleased to announce the call for two IFMSA internship programs in the World Health Organization European Regional Office (EURO), located in Copenhagen (Denmark)! The internships will be in the Gender and Human Rights Department, and in the Migration and Health Programme. What is the Gender and Human Rights Programme? The overall objective of the Gender and human rights programme at WHO Europe is to enable the WHO Secretariat and Member States to develop policies and programmes that are rights-based and gender responsive in order to improve governance for health and reduce health inequities. All our initiatives are based on the two recent strategies adopted by the 53 Member States in the WHO European Region: Strategy for Women’s health and well-being in the WHO European Region (2016) and the Strategy for the health and well-being of men in the WHO European Region (2018). Partners and civil society across sectors to strengthen health perspectives in gender and human rights initiatives and multisectoral platforms. What is the Migration and Health Programme? The Migration and Health programme, the first fully fledged programme on migration and health at the WHO Regional Office for Europe, was established to support Member States to strengthen the health sector’s capacity to provide evidence-informed responses to the public health challenges of refugee and migrant health. The programme operates under the umbrella of the European health policy framework Health 2020, providing support to Member States under four pillars: technical assistance; health information, research and training; partnership building; and advocacy and communication. The programme promotes a collaborative intercountry approach to migrant health by facilitating cross-country policy dialogue and encouraging homogeneous health interventions along the migration routes to promote the health of refugees and migrants and protect public health in the host community. The programme also manages the Knowledge Hub on Health and Migration which is a joint effort between WHO/Europe, the Ministry of Health of Italy, the Regional Health Council of Sicily and the European Commission. The partnership is committed to building expertise and competency on the public health aspects of migration and making knowledge and information in this area widely available. What is involved in the internship? Interns with the Gender and Human Rights programme would work on one or more of the initiatives bulleted below. The exact terms of reference would be decided in dialogue with the intern, based on her/his interest and the current priorities of the programme. Data gathering, analysis, the production of reports and communication material on the health impact of gender norms and stereotypes and of gender equality, including the documentation of promising practices. Supporting the monitoring of the WHO Europe women’s and men’s health strategies, in particular data gathering and analysis on how gender issues are addressed in national public health policies; how national gender equality strategies incorporate health and engage men for gender equality, on human rights treaty recommendations for women’s health, and other gender indicators relevant to health and well-being. Supporting specific projects focusing on gender-transformative action within 1) health promotion; 2) paid and unpaid care; 3) gender and health assessments at city level. Interns with the Migration and Health programme would work in generally supporting the work of the busy department across a range of projects. The exact nature of the internship would be discussed with any suitable candidate. When – Interns are able to apply to complete a 3-6 month internship any time between February 2019 and December 2019. Applicants will be asked to indicate their time availability in the application Google Form. Please note that this is a combined call for two separate internships. Applicants may apply for both internships but will be able to participate only in one internship. Visas – Interns will be supported to get a visa to work with the WHO in Copenhagen as required. Please check all the requirements, eligibility criteria, and conditions for WHO internships at http://www.who.int/employment/internship/en/ . Fill in this application form – this is an online form, no need to do anything else than to fill in & click on submit. Send the following documents by email to [email protected] with the ”[WHOEURO] Name of the applicant” in the email subject. All of these things need to be completed/sent before 6th January 2019, 23:59 GMT. In case of any document missing, the application will be considered as invalid. A number of shortlisted applicants will be recommended to the staff at WHO EURO, and will then undergo an official application process. Please keep in mind that the administration of WHO EURO will be in charge of making the final decision. Positively passing IFMSA application process still does not guarantee that you will be given the spot. In case of any questions please do not hesitate to email us at [email protected] CCing [email protected]. We are looking forward to reading your applications!